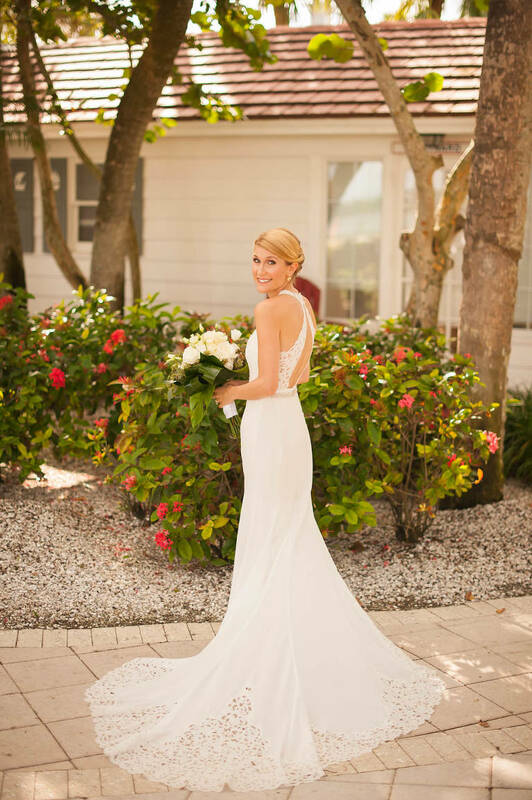 Holly and Andrew’s destination Clearwater Beach wedding brought together the ambiance of old world Florida with a luxurious tropical glamour. 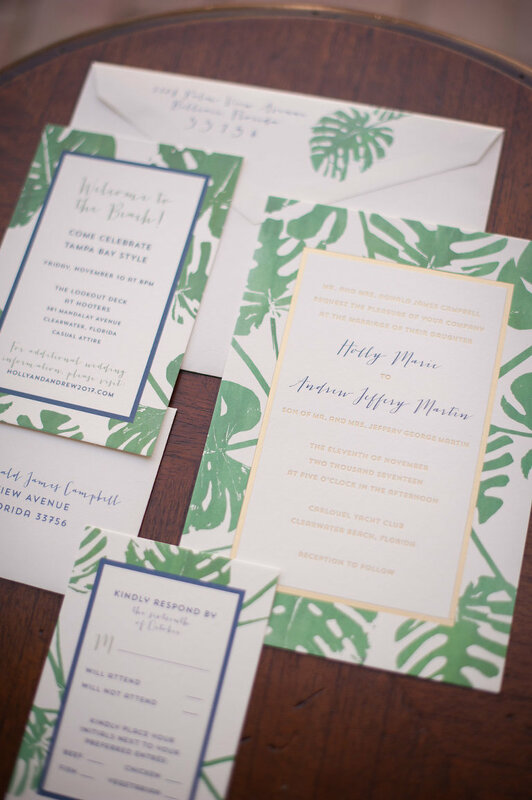 Selecting a color palette of navy, green, gold and white, the Michigan bride and groom embodied the greenery of Florida. The bride stayed on top of local trends and inspiration by utilizing our wedding planning tools and reading our publication. Planning their wedding from afar, Holly and Andrew knew the importance of hiring a local planner to recommend vendors and handle the logistics for the day. With the planning set, the bride focused on the wedding reception decor and ambiance. Looking back on their wedding day, the couple reminisced that despite the weather, they were able to take in an incredible sunset with their guests. 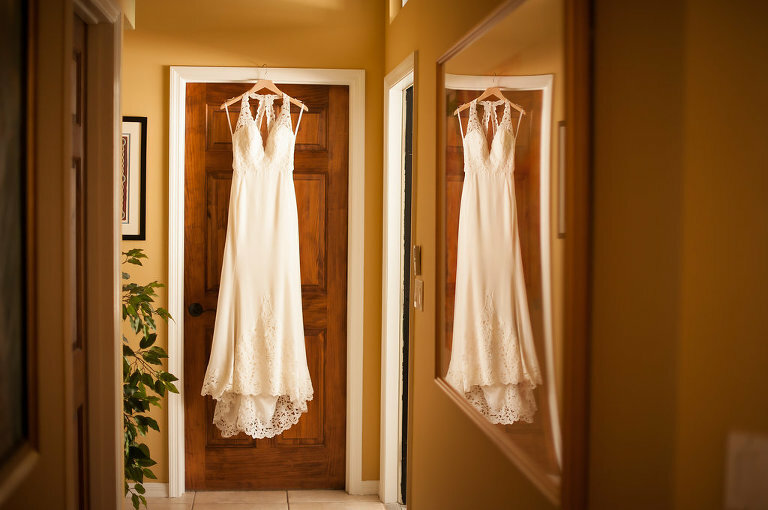 “A moment of panic occurred when we started to see raindrops coming down only moments before walking down the aisle. Our wedding guests were already sitting out on the beach waiting for us, so we had to quickly determine if we were going to brave the rain or relocate. We, fortunately, saw a break in the clouds and ran outside to get the show on the road. Not only did it turn into a beautiful sunset, which was more than I could ask for to begin with, but we got the most beautiful rainbow. Andrew and I had no idea that while we were getting married, we had a rainbow shining down on us. We didn’t realize it until we were walking back up the aisle, which is one of my favorite pictures. It was simply magical, we still can’t even believe it happened,” the bride reminisced. Andrew and I live in Grand Rapids, Michigan and had traveled down to Florida to visit my family for Christmas. My birthday is December 23, and it always tends to be a chaotic day of traveling, last-minute Christmas shopping and family starting to gather together. On the night before my birthday, Andrew asked me to take a walk outside to look at the Christmas lights. As we were looking at all the beautiful palm trees lit up, he got down on one knee. We then got back to the house to celebrate and dance all night with my parents, sister, and brothers. The following day we got to celebrate with all my aunts and uncles and cousins who traveled in, and we spent the evening enjoying our first Florida Christmas on the Jolly Trolley. It was a birthday and Christmas we’ll always remember! What was your bridesmaids dress inspiration? I wanted to give my bridesmaids the freedom to pick a dress (and shoes) they felt comfortable in, but that process can be overwhelming when you have a million options to choose from. I was drawn to a particular style of Joanna August’s dresses that featured a braid detail and there happened to be three different cuts/necklines. I was also drawn to the long flowy look on the beach, especially in November when it’s not as humid. I Want to Learn More about wedding attire from Bella Bridesmaids. I choose Bella Bridesmaids because my bridesmaids all lived in a city that had one: D.C., Chicago, San Francisco. So it was easy for everyone to drop in and choose their favorite style. We actually ordered ours through the D.C. store, which is where my sister (maid of honor) lives. Since I was planning from out of state, a wedding planner was key. We wanted someone who knew our venue well and could provide strong recommendations on vendors and overall logistics. We didn’t want to worry about the unknown. We also wanted to enjoy the process, so finding someone whom we trusted and would keep us on top of things was important. I want to learn more about planning from Parties A La Carte. When you first meet Jessica and the Parties A’La Carte team, it is obvious they are experienced and will do anything to make the wedding of your dreams happen. They are detail oriented and will make sure you consider all the options (that you may not have even thought of before). We hired them simply because they instantly made the overwhelming planning seem simple, straightforward and fun. We knew we could rest easy working with Parties A’La Carte and needless to say, they delivered. They even managed last minute ideas and decisions with no problem. On the day of our wedding, they made sure Andrew and I stayed on schedule (which we needed), made sure we had food and were hydrated, made sure we photo-ready at all times, and also reminded us to take in important moments throughout the day. Most importantly they took care of our guests and bridal party and made sure they were having fun and that the logistics and transportation were seamless. I can’t imagine the day of the wedding without their team! We went with a tropical, old Florida theme. I also fell in love with the greenery Florida has to offer by bringing in more palms than flowers in my decor. Together it made it feel like a romantic, tropical evening on the water. Our food even fit the theme with Cubans and seafood throughout the night. Navy, green, gold and white. 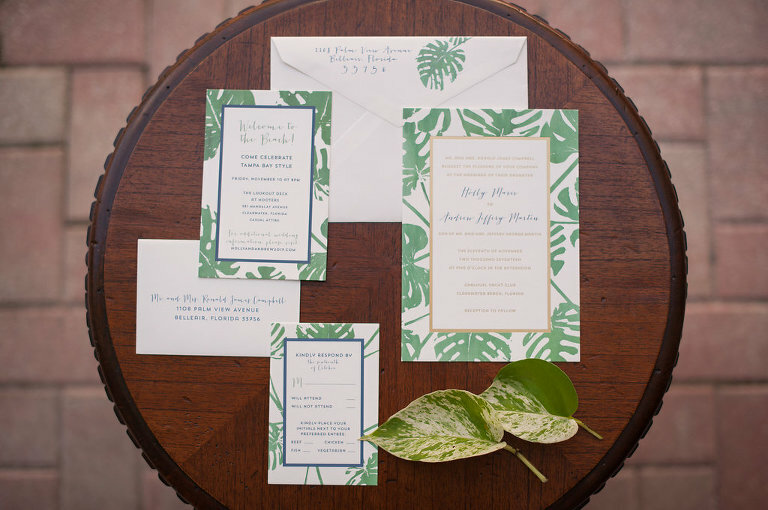 The colors came naturally to us when we brought in the backdrop of the ocean, palms and the classic white yacht club. I have also always loved gold, and I wanted that warm glow in the room with the dark wood, gold accents, and candles. Because our wedding was also in November we thought we could use deeper colors. What did you look for in a wedding rental company? I had no idea how important linens were to a wedding before I started the planning process! Our wedding planner did the hard work in finding linen options for us and they opened our eyes to options we never would have thought of. We wanted the linens to be simple yet elegant. I think we found the perfect combination that gave us a subtle pop throughout our venue. My husband and I love music. We wanted the music to be memorable throughout the entire evening, starting from the moment people stepped onto the beach for our ceremony. We had our guests listen to Motown love songs (a little tribute to our Detroit native family and friends) on the beach which you wouldn’t necessarily think of, but it was fun and romantic. My wedding party walked down the aisle to Van Morrison, while I walked down the aisle to The Beatles. Once guests walked over to the clubhouse, they were greeted with a steel drum band. We danced all night to oldies by the amazing The Black Honkeys, and then Andrew even took over the stage for a few songs with his former band. We had such a variety of fun, happy music that catered to all different ages and generations. We just wanted everyone to have an opportunity to dance to their favorite songs. We had other details like our personalized University of Michigan/Martin plastic cups for the beach and dancing and our guestbook Jenga game that also fit our personalities. It’s true when they say it goes by fast. We were so happy we took the time to visit with people and make memories not only on Saturday but throughout the weekend. So not only was it the best day of our lives, but it was the best vacation.